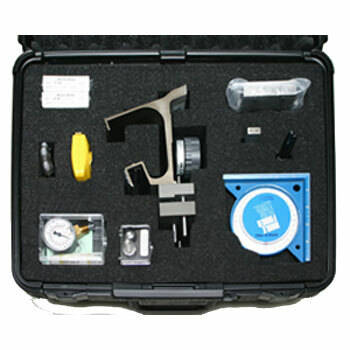 The Aero Almen Test Kit is intended for use in paint stripping facilities. The kit provides a way to check and verify the dry stripping process. For a given set of blasting parameter and media type and size, the kit will permit the measurement of benchmark residual stress imparted by the process. Once a given set of plastic media blasting (PMB) parameters is used to blast a set of Aero-Almen strips, the resulting baseline average Almen arc height is measured and documented. Alternative blast parameters, such as media type, nozzle size, media flow rate, pressure, stand-off distance, and blast angle can be used to develop better production capability by optimizing the stripping rate while maintaining the maximum Aero Almen arc height in accordance with the baseline levels measured. The Aero Almen test kit is not intended as a means of approving dry stripping systems and media types. Approvals must come from the appropriate authorities in the Air Force and from the appropriate approving authorities in other branches of the service or the FAA for commercial applications. Aero-Almen Gage and Aero-Almen Aluminum Strips may be purchased separately.